It was so disappointing to read Pete Evans' suggestion that dairy foods, in particular milk, were unhealthy. He even went as far as saying that the calcium in dairy foods leached calcium from the bones causing osteoporosis. What a load of hogwash. "Not only are dairy foods downright delicious, they are also extremely healthy." I often make the joke that I should work for Dairy Australia. They should totally put me on their payroll. That's because I find myself endlessly spruiking the benefits of dairy foods. And with good reason, too. Not only are dairy foods downright delicious, they are also extremely healthy -- the evidence doesn't lie. And that's why it was so disappointing to read Pete Evans' suggestion that dairy foods, in particular milk, were unhealthy. He even went as far as saying that the calcium in dairy foods leached calcium from the bones causing osteoporosis. What a load of hogwash. This is not supported by the scientific community and has no basis in the scientific literature. Evans was trying to suggest that dairy foods are acidic, which causes the body to leach calcium from the bones in order to neutralise the acidity. While dairy foods are acidic in nature, they do not cause an acidic environment in the body. This notion is completely baseless. The body has a number of systems in place to manage the acid-base relationship. Our lungs and kidneys principally coordinate this. So, Paleo Pete's assessment that dairy foods throw off the acid-base balance is completely unfounded. Further, dairy foods provide a nutritional punch. They contain over 10 nutrients important for our general health, nervous system and muscle function, energy levels and, of course, bone health. More specifically, dairy foods are a rich source of vitamins A, B1, B12, calcium, potassium, magnesium, zinc and phosphorous as well as protein and low GI carbohydrates. Eliminating dairy foods unnecessarily from your diet means you'll be missing out on more than just calcium. I often get asked if dairy foods are fattening. The answer is that some are -- ice cream and cream are calorific, so they should only be included occasionally. But, milk, cheese, yoghurt and even custard are not, and they should form part of one's daily intake. Studies show that people who regularly consume dairy foods are better able to maintain their weight and have a reduced risk of developing heart disease and diabetes. The reason may be due to their impressive nutritional profile. It is troubling to note that most of the population does not meet their recommended intake of dairy foods. Rates of osteoporosis are incredibly high in the elderly population, which may be due to a lifetime of poor dairy intake. So, the alarming rates of osteoporosis could be slashed if people increased their intake of dairy foods. Yes, consume a rich source of calcium to ward off osteoporosis -- it's pretty sound advice, really. So, how can we meet our recommended daily serves of dairy foods? That's easy. Try adding milk to your cereal or porridge and perhaps including a dollop of yoghurt on top too; snack on yoghurt, custard, cheese and biscuits at mid-meal times; add ricotta or feta cheese to salads and pasta dishes; and down a glass of milk after gym or before bedtime. And just to debunk another commonly held myth that dairy foods increase inflammation... in a nutshell, it's nonsense. A recent review of the current clinical evidence actually showed that dairy has significant anti-inflammatory properties. The only time dairy causes inflammation is when there is an allergy at play. So, the take-home message is: embrace dairy foods as part of your diet. 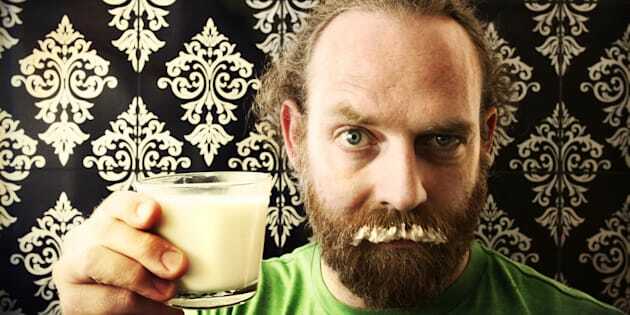 Go and get yourself a milk moustache and wear it proudly. I certainly do. And perhaps Pete should too.